Moral Monday Statewide Tour In Georgia!! American Friends Service Committee is excited to announce that we will be working with the Moral Monday Georgia movement to organize a statewide tour called, "Jail For Justice". Can you help host "Jail for Justice' tour in your community between July 28th and August 11th? What is the 'Jailed for Justice' tour? 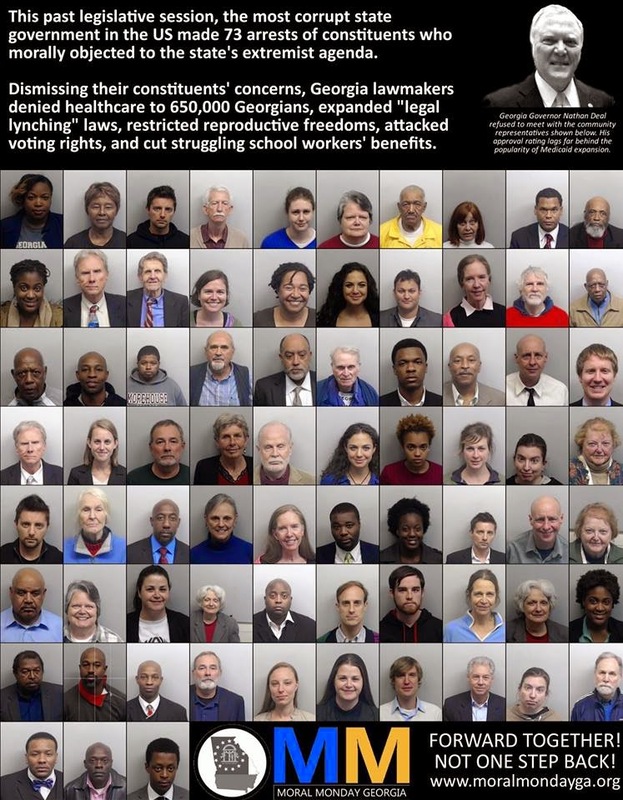 Over the course of the 2014 Georgia legislative session Moral Monday brought a national spotlight on what many have called the worst session in a generation. Moral Monday was able to create real dialogue about Medicaid expansion, Stand Your Ground law, a woman's right to choose, workers' rights, and other important issue through a series of dynamic actions that included mass civil disobedience. Over the course of the year there were 81 arrests. Arrestees were young, old, white, black, brown, gay, straight and everything between. Elected officials and prominent faith leaders also participated in civil disobedience with the intention of bringing attention to the attack on poor people. The, "Jailed for Justice" tour will feature a diverse group of 3-5 Moral Monday arrestees who will talk about why they choose to put their freedom on the line for their beliefs and what their hopes and dreams for the movement are as we count down to November's election and look forward to the 2015 legislative session. Each tour stop may include a different line-up of Arrestees. What are some of the Goals for the, "Jailed for Justice" tour? *We hope to bring the message of the Moral Monday Georgia movement across the state. *We hope to create space to hear about the issues Georgian's are most concerned about and foster discussion about how we might work together to create the change we want to see. *We plan to do voter registration at every stop! *We plan to organize a meeting with community/faith leaders after each tour stop. *We hope to begin the hard work of building the statewide movement Georgia needs to change the political landscape. Please email tfranzen@afsc.org or jrodriguez@afsc.org if you are interested in hosting a stop on the tour! 37 years, 10 arrests, 1 Birthday Wish!! 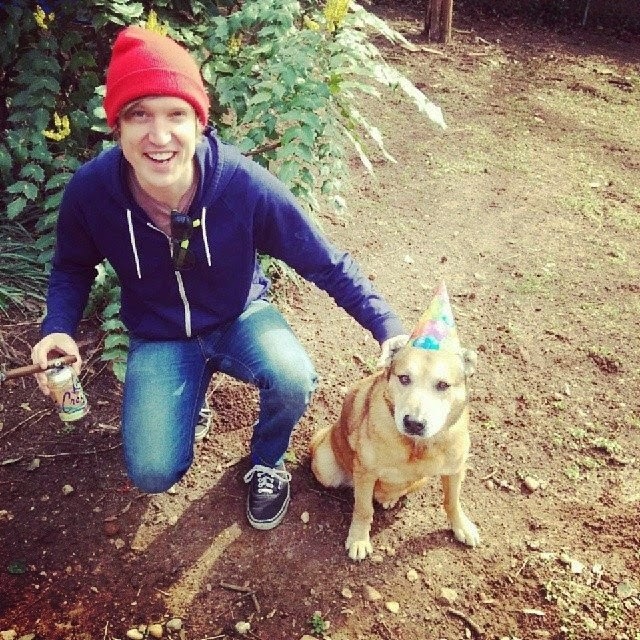 It’s my birthday and I have a very short wish list. It’s an exciting time to live in Atlanta! Some might be aware that Atlanta has more wealth disparity than any other city its size. That being said regular everyday people are standing up to racist laws, greedy banks, and bad policy. 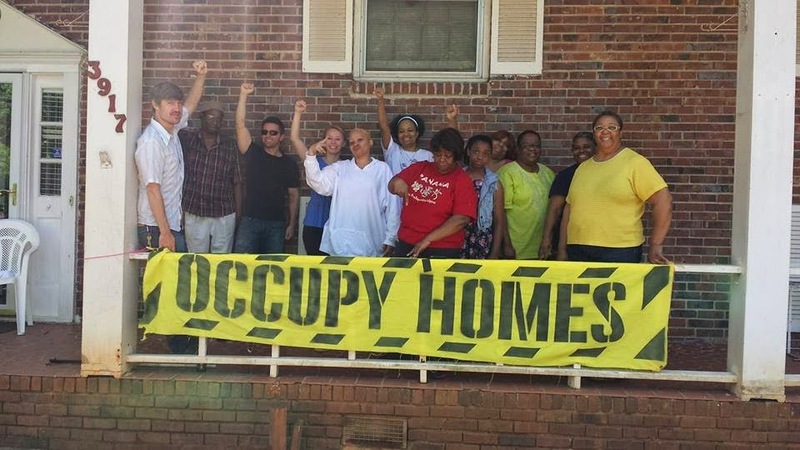 Occupy Our Homes Atlanta is an amazing organization that helps people fight for their homes. The movement brings renters, homeowners, and the homeless together to frame housing as a human right. The movement has managed to save countless homes. Freedom House hasn’t launched yet, but I’m already super excited about how this project is bringing folks together and the amazing possibilities it’s presenting. Freedom house is immigrant youth led and aims to provide housing, movement space, and small stipends for immigrant youth to do organizing work in Georgia. Today Georgia undocumented youth led a coalition that included Moral Monday Georgia folks in disrupting the Georgia Board of Regents meeting today. Why? As Lucino Gopar puts it, "Today we celebrate 50 years since desegregation, but students are still banned from colleges, we must end segregation now!" The Georgia Board of Regents has created policy that bans undocumented students from attending the top 5 Georgia colleges and forces them to pay international tuition anywhere else, which is basically impossible for regular people to attend college. On this election day as Georgians head to the poll we should keep in mind that tens and thousands of very hard working Georgians are locked out of the system. Today, in an act of civil disobedience, undocumented youth and allies blocked Washington st outside the Board of Regents meeting much like the Board of Regents is blocking access to education for some of our most talented young Georgians. Finally if you could take a moment to call the Georgia Board of Regents at 404-962-3050 & demand an end to university segregation in GA! Reverse policy 4.1.6! “Georgia Board of Regents is violating its own policy in order to discriminate.” A coalition of Georgia organizations is protesting against the segregation that comes as a result. 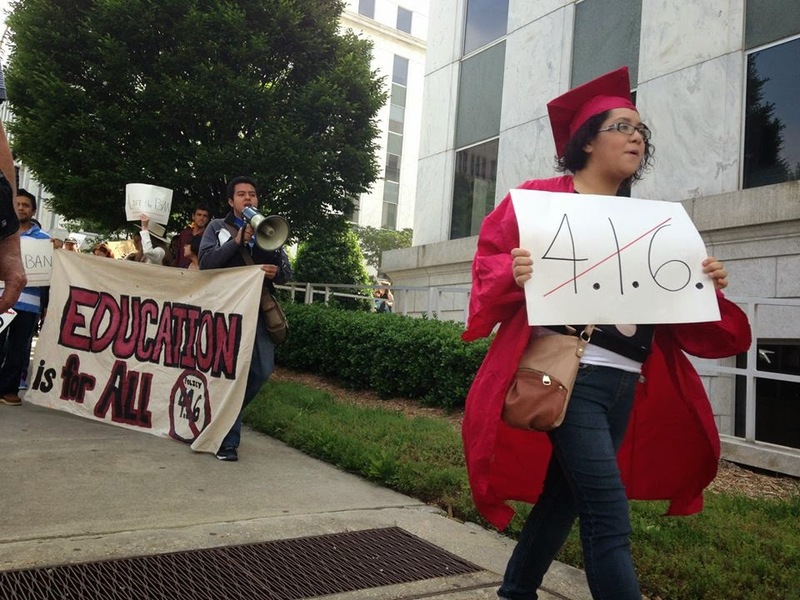 Tomorrow, Tuesday 5/20, the Georgia Dreamers Alliance, along with a Coalition of Organizations including American Friends Service Committee and Moral Monday Georgia, will urge the University System of Georgia Board of Regents to rescind Policies 4.1.6 & 4.3.4. Policy 4.1.6 effectively bans undocumented students from applying to and enrolling in the state’s five most competitive public institutions. 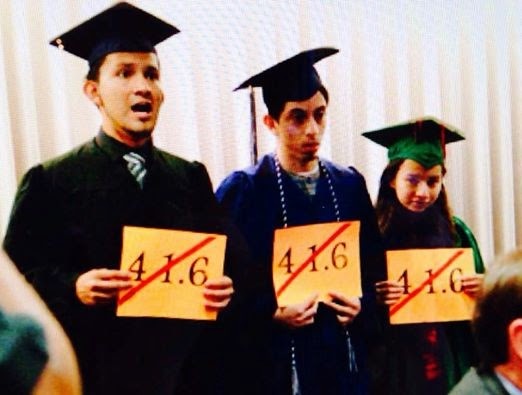 Policy 4.3.4 denies students with Deferred Action of In-state Tuition rates at all Public institutions in the state. The Georgia Dreamers Alliance will hold a rally to protest the Board of Regents denial of in-state tuition and access to the top 5 College & Universities to students who have gained legal presence under the Deferred Action for Childhood Arrivals (DACA) program. The Board of Regents meets tomorrow at the University system of Georgia building, 270 Washington Street, SW Atlanta, GA 30334. The demonstration is set to begin at 10am in front of the building, click here to link to Facebookevent. According to the Board of Regents Policy manual 4.3.4, a student must have "legal presence" in the country in order to be eligible for in-state tuition. It reads: “Each University System institution shall verify the lawful presence in the United States of every successfully admitted person applying for resident tuition status.” Through the DACA program, undocumented students have been granted "legal presence" while deferred action is in effect. Nonetheless, the Board of Regents has decided to subject thousands of Georgia students to this blatant form of discrimination. Students with Deferred Action who have sued the Board of Regents say their lives are on hold. An Obama administration order allows them to remain in the country with lawful presence. But the University System of Georgia still bars them from Georgia’s top colleges, and denies them in-state tuition rates. We demand the B.O.R to abide by their policy manual. Students with deferred action are no longer undocumented, leaving no legal basis for this form of discrimination. The Board of Regents’ ban is in flagrant violation of longstanding human rights principles expressed in the Universal Declaration of Human Rights (UDHR). 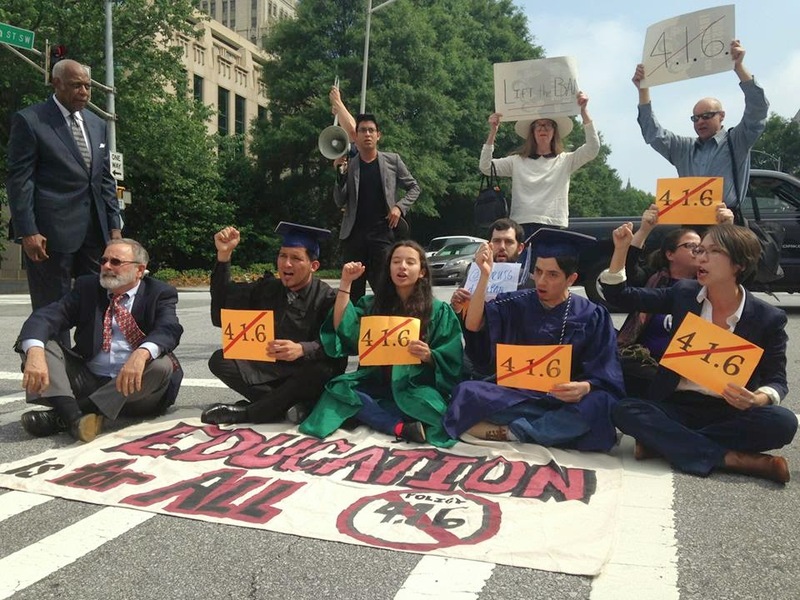 By shifting the basis for access to higher education away from individual capability to immigration status, the Georgia Board or Regents is violating customary international human rights norms. By limiting undocumented immigrants’ access to higher education, the ban also violates Article 25(1) and Article 26(2) of the UDHR. While the University of Georgia is celebrating fifty years of desegregation, thousands of young people who consider themselves Georgians at heart await to attend this university. This coalition is formed as the State of Georgia grows weary of its own history. On Wednesday, May 21st at 10:30am of 2014, the coalition will remember the Anniversary of 50 years of university desegregation when African American students were first allowed to attend these top institutions. Community leaders will come to speak in behalf of the African American community, whose struggle was not much different as they were also banned from the same top five universities in the state of Georgia simply for the color of their skin. By foreclosing the opportunity to attend these prestigious universities, the Board of Regents ban disincentives hard work and academic achievement. The Board of Regents is essentially taking us back in history, when African American students were not allowed to even apply to these universities. The ban repeats to undocumented students what once was said to African America students, that no matter how much they strive for improvement, they are incapable of ascending the socio-economic ladder and creating a more prosperous future for themselves and their families; this essentially creates a population of second-class citizens or as many would call it, a new era of segregation. 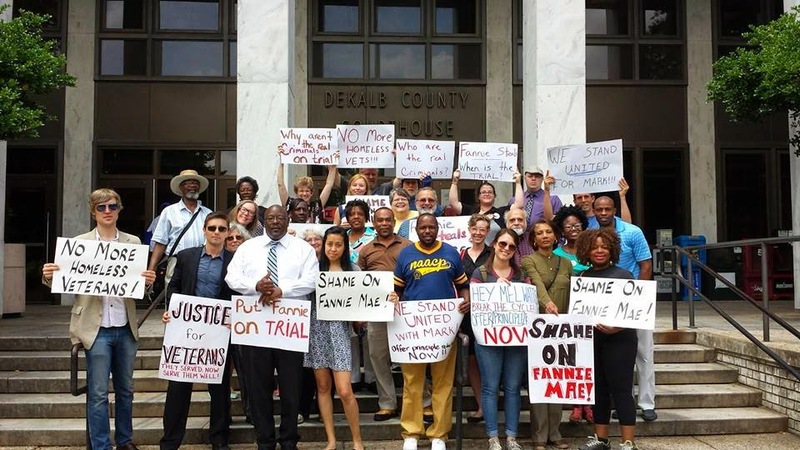 Last week at the Dekalb County courthouse, U.S. Army Veteran, Mark Harris and members of Occupy Our Homes Atlanta and their lawyers had a ‘Stand Your Ground’ hearing to argue that the protestors "stand their ground" when law enforcement attempted to evict Mr. Harris' from his house of 18 years. Judge Dax Lopez will hear the motions. Supporters held a pre-hearing rally on the courthouse steps. The Occupy Our Homes members were arrested trying to prevent the forcible home eviction of Desert Storm Veteran, Mark Harris . Mark Harris, served 21 years in the United States Army Reserve. Mr. Harris was on the verge of qualifying for a federally funded program to save his home (Hardest Hit Fund:. Homesafe Georgia program), when he was unlawfully foreclosed on by Fannie Mae, the financial backer. On March 6, 2014, the DeKalb Solicitor's Office filed a motion requesting that Judge Dax Lopez disqualify Attorney Mawuli Davis of the Davis Bozeman Law firm from his pro-bono representation of the housing justice activists. However, the judge ruled attorney Davis could remain in the case while three other attorneys, Shawn McCullers, Dionne McGee and Joshua Davis, joined the defense team on a pro-bono basis. In an unprecedented legal claim the attorneys for the protestors will assert that they had a right to "defend" the property and had “no duty to retreat" (i.e. stand your ground). "While our clients were non-violent, we believe that they reasonably believed they had a right to resist and should be granted immunity from prosecution. No matter what, we know we are on the right side of history", stated activist attorney Mawuli Mel Davis. Wednesday's motions also include a 1st Amendment claim that argues that the charges should be dismissed because that were allowed to peaceably assembly, as allowed by the First Amendment to the Constitution. The stand your ground motion was squashed by the judge but a second hearing was set for June 16th at 3pm to argue a 1st amendment motion. 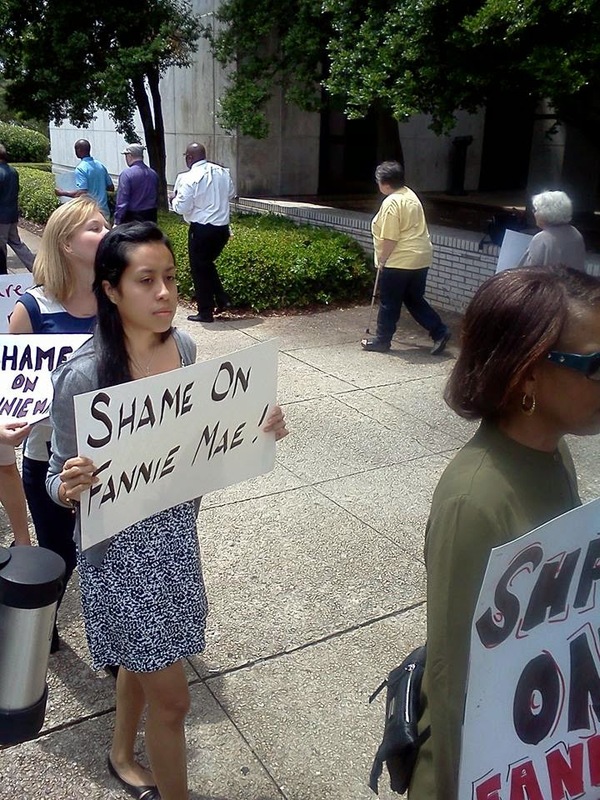 Representatives from Fannie Mae will take the stand. Basically the argument is that since Fannie Mae is taxpayer owned 1st amendment rights do extend to the drive way of the property where folks were actually arrested. "We are calling on justice seeking citizens to come to the courthouse and bear witness that working people have rights that should not be trampled on by corporate interests with the help of our government" stated an arrestee and American Friends Service Committee staffer, Tim Franzen. We encourage folks to sign and share Mark’s online petitionby clicking here. Fighting Wall Street on Main Street! On May 8th, 2014 the HAAS Institute and their partners released their "Hot Spots" report detailing the current state of the Housing Crisis' underwater mortgages. Tammy Doe's 30034 zip code was among the hardest hit in the nation. The Housing Crisis lingers on and it devastates new home owners and old home owners alike. Tammy’s mortgage was bought by a private equity firm called Colony American Homes(CAH). CAH is on a mission to securitize the rental market for maximum profit. In an effort to acquire as many homes as possible CAH shows up at foreclosure auctions with cashier’s checks in the millions to blindly purchase as many homes as possible. They often claim they are purchasing homes that are vacant but we find that’s often not true, as in Tammy’s case. Colony American Homes also claims that they care about the communities they “work” in, but we have seen the reality; the very economic collapse that Wall Street's caused has been a new source of revenue for private equity groups seeking to turn the millions of homeowners into their tenants as renters. Tammy Doe and her family are fighting for their home of nearly twenty years! They won't be bullied by the private equity firm trying to saturate their neighborhood with rentals and they won't go quietly. Tammy and her neighbors are planning to return to CAH this week, click here for details. After D'BABS Construction Inc., a black-owned, woman-owned, construction company, fell behind on their business mortgage during the financial crisis caused by the big banks, they were assigned to a specific employee at SunTrust, who held the debt, to make payments to in effort to catch up and avoid foreclosure. When that employee abruptly left SunTrust, D'BABS was left with no one to accept the special payments on their mortgage. After months of attempting to pay SunTrust, a realtor friend said they had seen the business location get auctioned off in foreclosure. The sisters of D'BABS had no idea they had been foreclosed upon. Since finding out they have been locked in negotiations with SunTrust's aggressive attorneys. SunTrust has chased off the other tenants in D'BABS' building, and is now working to evict and destroy this local woman and minority-owned small business. At this point Suntrust is aggressively moving to evict the small business despite multiple attempts to work out a mutually beneficial solution. 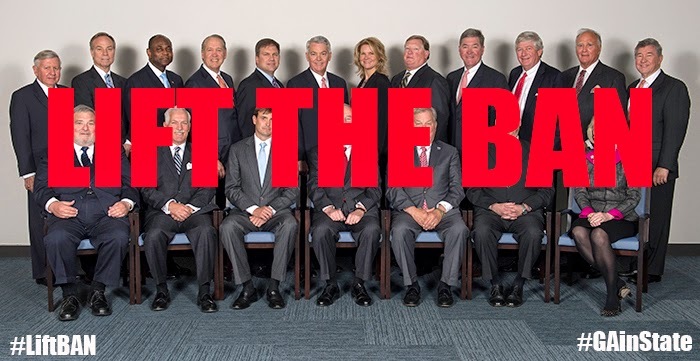 With SunTrust’s unwillingness to work with the women of DBABS they have been left no other option but to paunch a public pressure campaign in a last ditch effort to keep the small business open. So far over 2k people have signed an oline petition to save the small bussiness. 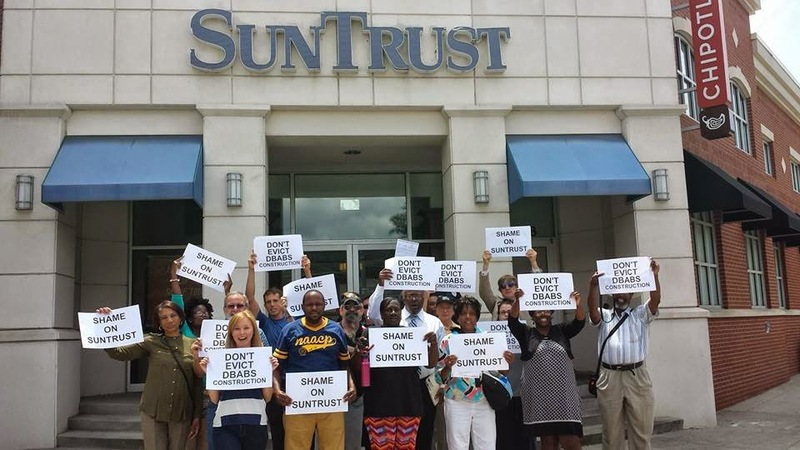 D'BABS workers and community supporters have committed to a weekly rally outside SunTrust until a solution is found.